Is the Pen Mightier than the Carrot? It’s great to discover that something you like doing is actually good for you. That was the case for me recently when I read an article about the health benefits of writing. I always suspected that journaling helped keep me sane. I’ve been doing it since I was in my early teens and have boxes full of spiral notebooks to prove it. Writing down my thoughts and feelings helps me process experiences, make decisions, set and track goals, cope with stress, and work my way through problems. In the past few years it has also become a creative outlet as I’ve rekindled my love for writing poetry. So it made sense to me that journaling would be good for emotional health; what surprised me was learning that putting pen to paper can positively affect physical health as well. But of course, it’s well known that mental/emotional health isn’t separate from physical health. Turns out, people who write regularly about their emotions (also known as expressive writing) enjoy a slew of health perks, including fewer illnesses, less time in the hospital, lower blood pressure, better liver and immune function, and faster recovery from wounds—just to name a few. And the good news is it doesn’t take a lot of time to reap the benefits. Writing for just 15 to 20 minutes a day can make a significant difference in your well-being. Psychotherapist and author Kathleen Adams, LPC, calls her journal her “79-cent therapist,” and I can relate to that. In my twenties, within the span of three years, I experienced two major personal losses—unexpected deaths of two people very close to me. Looking back, I know that writing was a lifeline during those dark times. As I poured out my grief, anger, and confusion into my journal, I slowly began to heal. Don’t get me wrong—I’m not discounting the value of seeing a professional therapist. I’m just saying there is something about a blank page that is very comforting. The page doesn’t give advice or judge. It just listens. In fact, many therapists recommend journaling as part of treatment. While my example above is a dramatic one, you don’t have to have some Big Topic in order to write. Start with whatever is going on in your life and how you’re feeling about it. Here are some great tips for those new to journaling. Another little secret: You don’t have to write well in a journal. No one else has to see your scribbles. It’s the process that counts. And if you find your inner critic won’t leave you alone, here’s a trick I use: visualize or draw your inner critic. Have fun with it—make him/her ugly and ridiculous. (Mine is a warty green witch with cat-eye glasses.) Then imagine a thick, sound-proof bubble around this creature. Voila! Its lips are moving but no sound is coming out. If you’re like me, this will make you laugh and put that negative little voice into perspective. Whether it’s due to good genes, healthy lifestyle choices, regular journaling, or a combination of all of the above, I can attest that my general health is very good (knock on wood). Writing is just one tool in my wellness toolbox. The great thing about journaling is you can do it pretty much anywhere. It’s easy, cheap (think back-to-school sales), and doesn’t take much time. If you’re already journaling, pat yourself on the back. If not, why not give it a try? Our guest blogger, Sabrina, has committed to her kickboxing class, and while do so, she has found a few tricks to make her commitment stick! After completing 50 workouts, my trainer rewarded me with this shirt. On the front it says, “I EARNED THIS SHIRT”—a token of my commitment! For more than four months, I’ve been wrapping my hands and strapping on my boxing gloves three to four times a week. After each workout, I leave the kickboxing gym dripping with sweat and smiling. For the first time in my life, I’ve committed to a long-term fitness routine I can maintain. I had tried (and failed) at all kinds of things—going to the gym, workout videos, Zumba classes, yoga classes, running—the list goes on. And for more than four months, I’ve consistently hauled my cookies to that gym. The best part is that after four months, I still love it. Make sure it’s convenient. This gym is located between work and home. I go in for my workout before I ever even see my couch. If the gym had opened across town, this might’ve been more challenging. Prepare ahead of time. I pack workout clothes for the week on Sunday night, then take my gym bag to work on the days I plan to work out. I also change into my workout clothes before I leave work, so I’m ready to hit the ground running when I get to the gym. Allow some flexibility. I made a deal with myself that I would kickbox at least three times a week and would not go more than three days without a good sweat session at the gym. This way, I don’t feel like my life revolves around my workouts. Set short-term goals. Long-term goals are great, but they’re easy to lose track of. My short-term goal is the CHOW (challenge of the week). Every time I go in I look at who is in the lead compared to where I’m at and decide if I’m going for the win or going for the personal record. And no matter which one I choose, I’m always choosing to get better. Mix it up. 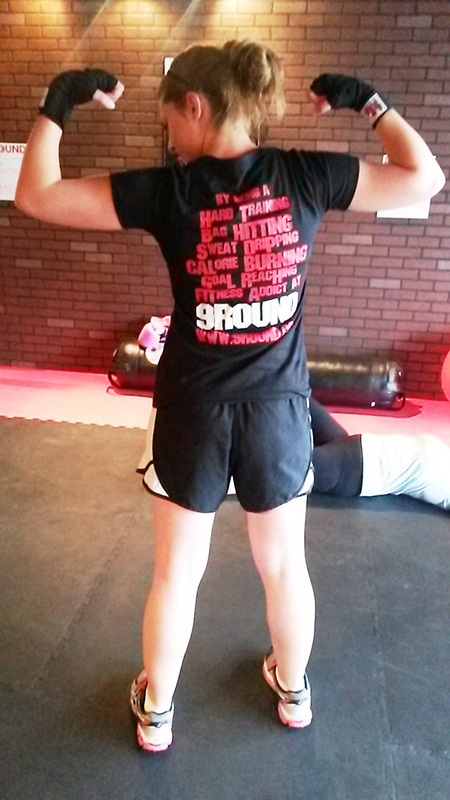 9Round is set up as a circuit with nine stations (three minutes at each station), and the workout changes every day, so I’m never bored and my body doesn’t get used to the same ol’ routine. For that reason, I’ve been sore ever since I started. Make your workout get tougher with you. After four months, I’d really be stuck in a rut if I couldn’t modify my workout to make it more challenging. When I first started, I would’ve been lucky if I could do more than ten burpees in three minutes. (Have you seen or done a burpee? If not, you should check it out. And for three minutes? Longest three minutes EVER.) When burpees recently came up as the CHOW, I did 29. Next time, I’m breaking past that 30 mark. That’s going to happen. Have fun! If you pick a workout routine that includes the things listed here but you hate it, forget it. There are too many options to try to commit to something you don’t want to do. There are days when I don’t feel like kickboxing. But by round four I’ve got my gloves on, I’m punching the bag with all I’ve got, and I’m always glad I went—it makes me feel strong, powerful, and confident. That’s what keeps me going back. No matter what kind of workout routine you choose, if you’re able to commit to it, you’re going to wonder how you ever got along without it.